We’ve decided to bring something new to the landscape of Edmonton florists this holiday season. We’re happy to introduce FaBLOOMosity’s first limited edition Branch Box! Our designers were inspired by bohemian Scandinavian wall hangings that use yarn and reclaimed wood to create tasteful home décor, and from there, we took levelled it up in classic FaBLOOMosity style by adding flowers. We don’t want to be selfish and keep this décor to ourselves — we want floral everywhere in everyone’s home because, as we’ve always said, life’s too short for ugly flowers. So what we’ve done is packaged the materials in our Branch Box and included step-by-step instructions to make this custom hanging flower arrangement that suitable to everyone’s taste and colour palette. Of course, since Christmas is coming, you know we had to make it holiday-themed. 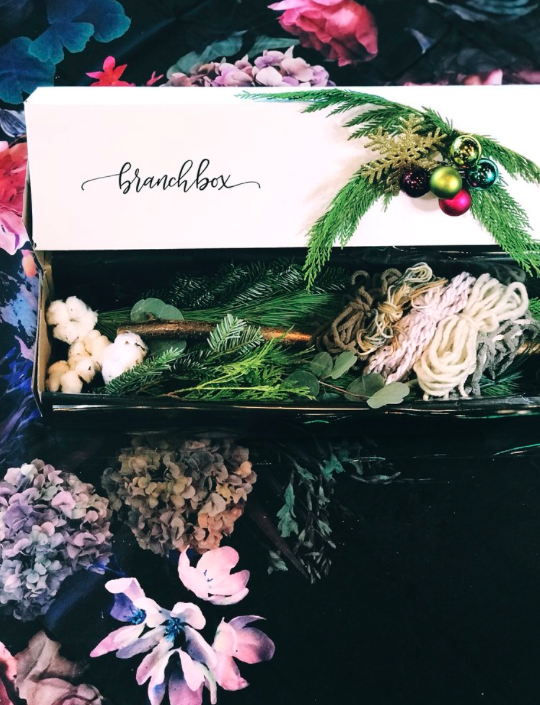 Each box includes boughs of pine, cedar, and fir; a branch; pinecones; cotton blooms; and variety of Christmas baubles in different colours for you to create the arrangement of your dreams. We know everyone likes fresh flowers like hydrangeas, roses, and orchids, but by using winter greens and cotton, you can have a long-lasting flower arrangement sprucing up your home for the entire season! You can order one for yourself, gift it to friends, or even use it at a Holiday party as a fun activity to do with cocktails in hand. We just did a wall hanging workshop, and with the yarn a-weaving and the champagne a-flowing, everyone had a blast — no silent nights here!